Bien que je n’aie pu, à ma grande déception, n’avoir qu’un bref aperçu du collectif vu mon arrivée tardive au spectacle, c’est une belle découverte que j’ai fait avec le Grand groupe régional d’improvisation libérée de Rimouski. Musique très expérimentale, on avait l’impression d’assister à la création d’une trame sonore de film dramatique, chacun des musiciens étant complètement plongé dans le maniement de son instrument. Il était très intéressant de voir, tantôt les violons, tantôt la guitare, tantôt l’accordéon (et j’en passe) jouer de manière totalement réinventée, créant des sons inhabituels avec ces instruments classiques. Chapeau à la dernière pièce, qui au début était extrêmement intense mais qui, avec brio, s’est essoufflée peu à peu en fondu jusqu’à ce qu’aucun son ne se fasse plus entendre. La douzaine de musiciens m’a vraiment épatée quant à la liberté dans son jeu et à la créativité derrière cet amas de sons. Those who get thrilled in recalling orchestral masterpieces such as Strings With Evan Parker (Emanem) will find something quite flavorsome to chew here, though not on an identical level of artistic strength. GGRIL is a collective from Rimouski, Québec, described as the “home big band » of the Tour de Bras label. Exclusively composed of musicians of different ages and experience based in the Lower St. Lawrence region, over the years the ensemble has played with several leading lights of the improv landscape. This particular set was taped in April 2011 after a brief clinic led by the English master of swirling reeds. Whereas the concert starts with a completely free piece — Semis — in which the players waste no time in finding contrapuntal stratagems by reducing the toe-dipping procedures to the required minimum, the subsequent tracks Bouturage and Marcottage are directed, respectively, by Parker and violinist Raphaël Arsenault. Still, the music remains entirely conceived on the spot, showing a wealth of veins and colors and an idiosyncratic sense of humor (a gorgeously wacky tuba solo — courtesy of Gabriel Rivest — at the beginning of Bouturage is my overall favorite snippet of the entire disc). Electric guitars and bass furnish the action with the right quantities of charged rush when needed; a couple of accordions warrant substrata of folk echoes that sound preposterous and suggestive at once. The attendance of guest trombonist Scott Thomson adds fuel to the fire in the “melodically bizarre” department, thus balancing the more overt tendency to seriousness dictated by two violins, a clarinet and an acoustic bass. A propulsive consistency is not missing, and — judging by the bursts of audience laughs sporadically heard — a theatrical component must have been applied during the exhibition. Parker’s soprano and tenor work just fine without exceeding any limit as he immerses himself in the improvisational ebb and flow with flexible modesty. A few attentive spins and you’ll see that there are some values to remember in this totally respectable release. Certains sont professionnels, d’autres sont amateurs: le GGRIL, basé à Rimouki, petite ville de l’est du Québec, dispose d’une dizaine de forces vives. Evan Parker, après Joëlle Léandre ou Jean Derome, est ce soir leur invité. Tout commence avec Semis, improvisation collective, courbaturant une masse épaisse, sobrement perforée par le soprano puis le ténor du britannique. Le concert se poursuit avec Bouturage, dirigé par Evan Parker. Débutant en douceur, la conduction de Parker posera quelques sûres balises (motif rythmique s’accélérant, modulations, surgissement d’une clarinette intrépide, accents répétitifs) avant d’encourager un intense duo d’accordéons. La dernière pièce, dirigée par le violoniste Raphaël Arsenault, laissera le saxophoniste — ici au ténor — évoluer en soliste au sein d’une improvisation anxiogène, ombrageuse, inquiétante. Oui, une belle soirée pour tout le monde. Adding another voice to an established improvising ensemble is more precarious than it seems. With a group having worked out strategies allowing for individual expression within a larger context — and without notated cues — the visitor (s) must be original without unbalancing the interface. Luckily the sessions here demonstrate successful applications. 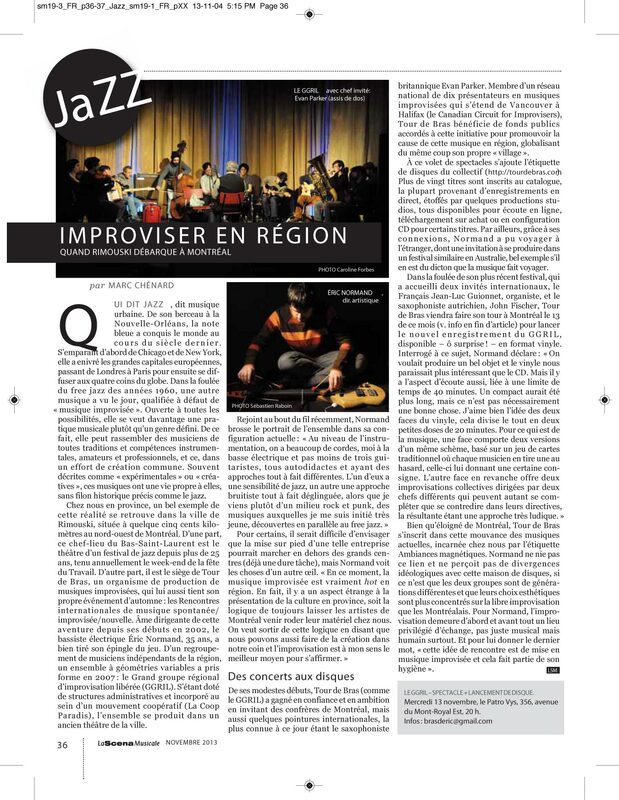 Invited to Rimouski, Quebec to give a workshop, British saxophonist Evan Parker also participated in Vivaces (Tour de Bras TDB9006 CD), recorded with the 12-piece Grand groupe régional d’improvisation libérée (GGRIL) . Made up of players from different musical backgrounds living in the Lower Saint-Lawrence region, GGRIL is distinctive in that the group includes two electric guitarists, an electric bassist plus two accordionists, but only three horn players. Using these circumstances to best advantage, these tracks, alternately directed by Parker and GGRIL violinist Raphaël Arsensault, employ the accordionists’ tremolo pulsing and sweeping electronic oscillations to thicken the bottom. With upturned slices from the strings and barnyard cries from the squeeze boxes, two clarinets and the tuba, it’s often Parker’s restrained undertone that gives a linear shape to the improvisation. The best example of this is Marcottage that manages to include contributions from nearly every GGRILer. As Parker pushes forward with staccato split tones he’s backed by sympathetic grace notes from fellow guest, trombonist Scott Thomson, and skittering, slurring accordion lines. Triangle pings signal a timbral shift and presage a ferocious solo from the saxophonist. 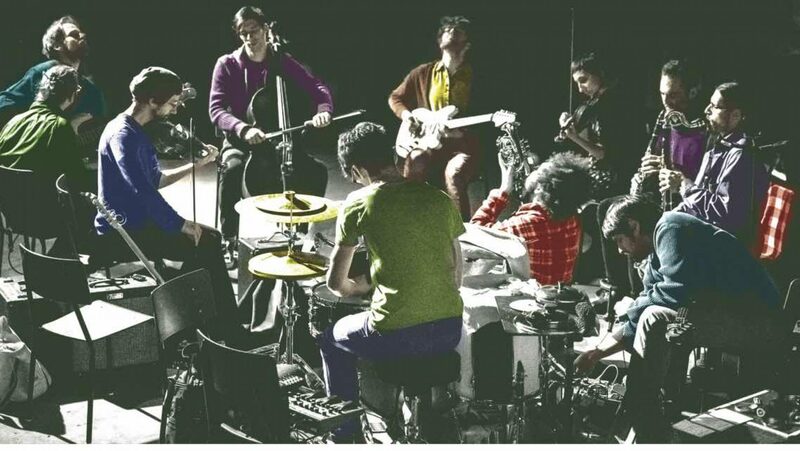 Band members’ responses range from rebounding percussion ratamacues, crackling electronic runs from the guitars and bass plus one accordionist sounding a faux balladic line as the other pumps powerfully. Finally the mass cacophony downshifts to a satisfying connective rumble.